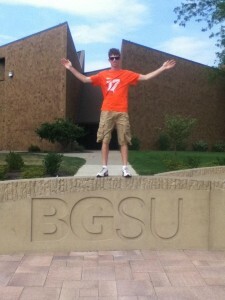 BGSU is known for many things. Traditions, organizations and a great atmosphere. BUT one thing most people don’t realize is how well-known we are for our music program. BGSU ranks up in the top 100 music colleges in the country! Being a part of this college is more than I had ever hoped for in my musical studies. I always knew I wanted to go to this university, but I have only known about the music college for about five years. When I first got the opportunity, I attended Honor Band, and then I spoke to the professor who is mentoring me in jazz studies. The instant I met everyone here, I loved it. Everyone in the Moore Musical Arts Center is extremely nice and more than willing to help anyone who needs it. When I first met my classmates, I immediately became friends with them, and that leads me to what I want to talk about. The Batchelder Music Community is where most of these music students live. I had my first preference of dorm as Centennial, but I am extremely glad that I got Kreischer as my place to live. There are so many resources at my fingertips just by living in Kreischer. For example, because many music students live in the Batchelder Music Community and you are all taking the same classes, if you have a question you can just go down the hall and ask instead of having to call someone or wait to ask your teacher. Someone who knows the answer is probably on your floor. In this learning community, we also have the luxury of practice rooms for the people who live there. Two practice rooms with pianos are in the lobby area of Kreischer for anyone to use if the music building is locked or if it is just too cold to go outside. However, I will say that with the music building opening at 7 a.m. and closing at 1 a.m. seven days a week, I have never had a time where I was not able to get in. Side note: Some universities have their music school set up so you are accepted into the university and you are automatically accepted into the College of Music. At BG, you must be accepted into both and audition for the music program.